Yes, the worlds of high end and fast food do meet at some point. After fashion shows, we all see the bleary-eyed models heading to McDonalds to nom on some fries, and fast food was introduced to fashion through pop culture by Jeremy Scott. But this is a whole new level of hybrid. 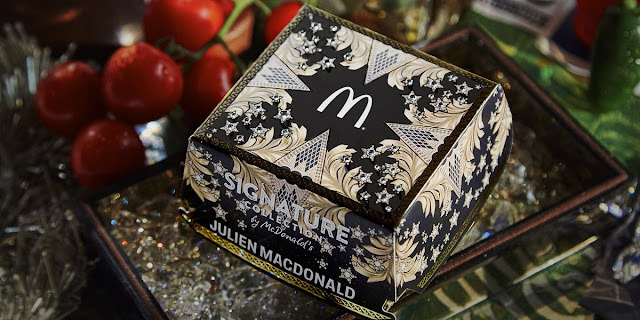 Yes, someone actually created a limited-edition burger box for Mcdonald’s new “gourmet burger” (try not to roll your eyes), but the box is actually pretty cool, and we would repurpose it for our own uses. Wouldn’t this make a lovely jewelry or herb box? It’s a black and gold, Baroque inspired look that looks very signature Versace. But apparently it’s signature Julien Macdonald, the London designer they commissioned to make this piece, who has had his pieces worn by many a star. The designer himself looks like a riot (have you ever seen a V that deep?) and his inspiration will also make you LOL. He draws inspiration from “my fashion creations and iconic embellished red carpet dresses”. We're not sure how this red carpet gowns translates into black and gold fast food box, but the reason for the addition of crystals makes more sense, now. And Julien’s own designs that our favorite celebs rock are also quite gorgeous. Will Instagrammers who are anti-fast food but pro fashion come and snap pics of their fresh manicures grasping these little boxes? Only if you’re in the UK at certain McDonalds showcase events will you be able to get your hands on these babies. Well, at least it’s for a good cause. Proceeds to go the Ronald McDonald House charities. Do you like the new and luxurious, black and gold rebranding from McDonalds and their departure from red and yellow? Tell us if it’s worth booking a flight to the UK!